A MORNING FULL OF CRAZY MEGA64 NEWS!! WHAT'S NEXT?! What a crazy morning for Mega64! Lots of news to report, so let’s get right to it, yeah? First off- Mega64 is coming to MOMOCON in Atlanta, Georgia! We mentioned this before, but now we have all the details ready to share. The show is May 28-31, and our main panel, “Mega64 Panel to End All Panels” will be Friday, May 29th at 2PM in the “Villains” room! 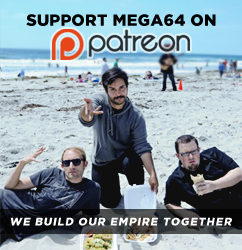 Then on Saturday the 30th, we’ll be taping a LIVE Mega64 Podcast at 9:30PM in the “Sidekick” room- come watch as we live stream our podcast, and you’ll be able to chime in and ask anything you want! Outside of those panels, we’ll be having a couple signing sessions as well- one right after our panel on Friday (at 3:30PM) and another earlier on Sunday of the show at 12:30PM. Feel free to stop by, get something signed, chat with us, or whatever you want. We don’t have a booth at the show, but we may try to bring some rare items with us to the signings. Be sure to pay us a visit! Secondly- In case you missed it, we were on a live stream on Monday with the legendary IGA! That’s right, the creator of “Castlevania: Symphony of the Night” is making a new game, and we joined up with his posse in San Francisco to celebrate the news. You can skim through this 8 hour live stream to see Derrick and Rocco pop in and out. We’ll also be adding some of the highlights to Mega64TV later on if you missed them. Thirdly- A quick notice to tell you that our insanely-beyond-sold-out SNAPBACK HATS are coming back to our online store this Friday at 10AM Pacific. They’ll also be joined by the return of our “Icon” shirts as well. Order those as soon as they go up if you want them… you’ll regret it otherwise. And last but definitely not least… You may have noticed that Nintendo released a brand new video today promoting their plans for E3 2015! And in case you’re wondering… yes, the Mega64 crew did help in creating the video (as if you couldn’t tell by the sound of my gnarled singing voice). While we weren’t really in spotlight of this piece, we still worked behind the scenes to bring Nintendo’s big announcements to life. As crazy as this week has been, it's only gonna get crazier. Look for more announcements and fun stuff from us later in the week. As always, thanks for joining us here at Mega64.